Bjørn Wiinblad was world-famous – as were the get-togethers and dinners he hosted at his home, “Det Blå Hus” (The Blue House) in Lyngby, north of Copenhagen. Here, guests ate and drank in the glow of plentiful candlelight, while the combination of Danish culture and Wiinblad’s generosity created a unique, intimate and cosy atmosphere. The tall, slender glass and metal design of Bjørn Wiinblads Hurricane lamps is a world away from the chubby porcelain designs that the multi-artist is otherwise famed for, but the great richness and the organic aspect are still evident, and the shiny silver candle holder immediately caught on with both new and old Bjørn Wiinblad fans. Now all design fans can follow in Wiinblad’s footsteps and invest in an extraordinary light source, ideal as the nights draw in. The new lamps fit perfectly into autumnal and Christmas settings where you need ambience, and they add a trendy touch to today’s most sought-after metal: brass. Hurricanes reaching new heights The candle holders, due to be launched in the three familiar sizes (40 cm, 50 cm and 60 cm), have also been given new functionality this season, with Bjørn Wiinblad Denmark focusing more on the hurricane “selfassembly” aspect of the design. 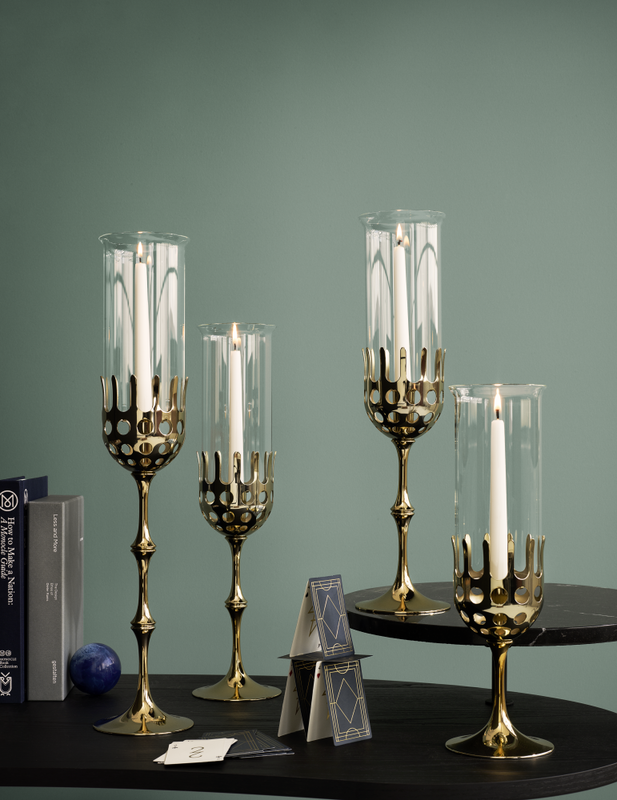 The 50 cm and 60 cm candle holders are both based on threaded segments, giving the hurricane its distinctive “joint”. This decorative detail can also be exploited to add or remove another segment to adjust the height of this dynamically designed candle holder for special occasions. Wiinblad used hurricanes himself all around his homes. They can be used as wall candle holders, chandeliers and pedestal candle holders that really let the design shine, showing how the hot metallic brass wraps itself around the glass like water lilies enclosing a flower. This organic simplicity makes it easy to use the candlesticks in minimalist tableaux and levels, or pair them with seasonal flowers in jars and vases as a lavish centrepiece on the Christmas dining table.